The human body develops different needs as we get older. One of those needs is additional assistance in the bathroom. A bathroom commode chair is a great way to gain that extra support and maintain some of your independence as you age in place. Standard and shower chairs come in all shapes and sizes to suit a variety of needs. Standard commode chairs are typically used at bedsides or over toilets, while shower chairs are designed to be used directly in the shower as well as the previously mentioned areas. Here, we have outlined some of the best commode chairs for you to peruse. This standard shower chair is a well-constructed, quick-drying, easy to use product with a comfortable mesh backing that supports well. The wheels make it easy to move, and you’ll love the grips on the arms. 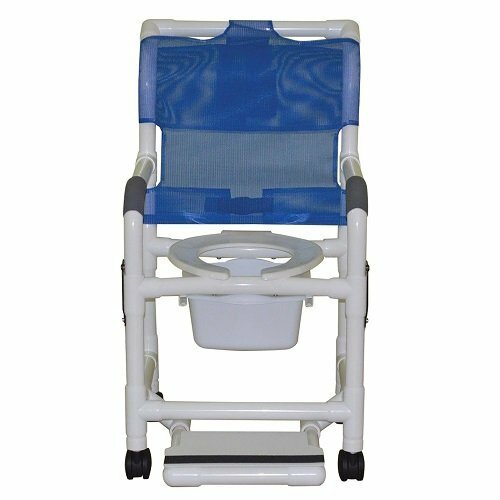 The MJM International Standard Shower and Commode Chair is a great all-around product for seniors. Made from durable plastic with reinforcement at stress areas, this chair holds up to 300 pounds for maximum safety and reliability. A healthcare grade product, this commode and shower chair utilizes mesh to complete the full back mesh sling. A personal pocket is included on the mesh for storing items such as toiletries, allowing seniors to bathe with everything they need within reach to reduce the risk of injury. The unique design is made to dry fast and makes the seat comfortable, supportive, and low-maintenance. Along with this product comes a built-in, self-storing footrest for extra support and safety. The drop arms are great for resting, sitting, and standing and are anti-slip. Anti-bacterial materials resist mildew and bacteria growth as well, which gives you one less thing to remember or worry about. Made with a deluxe, elongated open front seat, you or your loved one will find extra comfort. The commode pail holds up to 10 quarts of waste and easily slides out for waste removal and cleaning. This chair is made to move easily, support greatly, and provide comfort and confidence to its users both in and out of the shower. Lightweight and featuring locking wheels, this chair is easy to move, store, and hold in place. The rust-resistant aluminum is sturdy and easy to clean as well. This two-in-one shower chair and commode is our best with wheels, featuring an intelligent design that is both lightweight and durable. Made from rust-resistant aluminum, this chair provides both support and convenience, weighing just 16 pounds but with a weight capacity of 300 pounds. With a goal of giving seniors a comfortable and pleasant bathing experience, the Drive Medical K.D. Aluminum Shower Chair and Commode boasts a comfortable padded seat with an open front design to make use both easy and relaxing. The wheels on this chair make movement and transport extra convenient, whether someone is in the chair or not. This is excellent for caregivers who are tired of chairs that are hard to push. Additionally, the included commode bucket and back of the chair are both removable for easy cleaning and storage when not in use. Three non-skid casters make this item safe and secure, ensuring seniors will stay in place and reduce the risk of a fall or injury. Finally, the brass push-button installation system makes assembly a breeze. The drop arms on this chair, along with the easily movable footrests and locking wheels, make transport simple. Caregivers can easily navigate the swivel wheels, even on carpet. Be aware, though; this chair cannot be used in the shower. EASY ASSEMBLY with no tools required. See video for assembly instructions. Not for use over a toilet. 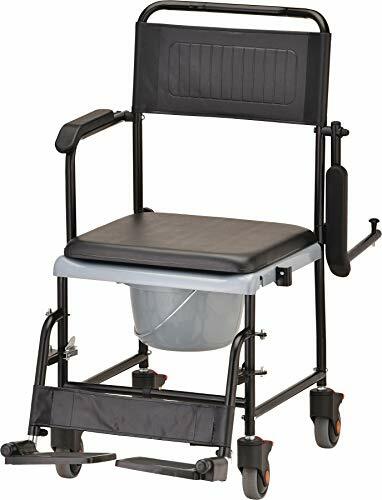 The NOVA Medical Products Drop Arm Transport Chair and Commode is designed to make transport easy for both caregivers and seniors. Showcasing its convenient drop arms, the product’s armrests easily release to free space and make it easier to lift and move patients or loved ones from the chair. Paired with the intuitive removable swing-away footrests and locking rear wheels, safety and convenience are clearly top priorities. While this chair is made for transport, it also features a commode bucket and lid for quick and easy bathroom use. The bucket is easy to remove, and a padded seat cover turns the chair from toilet to transport fast and discretely. Caregivers and seniors alike will be able to clear the bucket with ease. With a durable steel frame, you will find this chair to be reliable and strong. It holds up to 250 pounds and has a seat height of 20.5 inches. If comfort, style, and simplicity are your goals, this chair is your match. The highly comfortable PU foam is water resistant yet very comfortable, and the wide-set seat is made to accommodate any size. Additionally, the look is much more modern than other commodes. While many commode chairs are highly functional and get the job done, not as many focus on comfort. The UltraCommode by Platinum Health is the exception. This commode and shower chair combo is made for exceptional comfort, featuring a soft, padded, warm seat base along with a backrest and armrests that are great for supporting older bodies. The commercial grade PU foam is designed to never absorb water. At the same time, it prevents sliding and slipping and is extremely easy to clean and disinfect. These features not only maintain comfort for users but allow you to utilize it in your shower without the risk of falling and injuring yourself. An extra wide, properly sized seat adds to the area of comfort, while the open seat front makes cleaning and hygiene easy. You can swing the armrests out of the way for extra space if need be, including for transfers from wheelchairs. The fast and easy assembly is tool-free and uses medical grade, rust-free aluminum. As an added bonus, you will love the modern design that competes with the hospital-likeness of other commodes. While this chair lacks the proper sized opening for its bucket, the sturdiness and comfort of the seat cushion can’t be beaten. It is also one of the highest adjustable seats on the market. The Medline Heavy Duty Padded Drop Arm Commode features a heavily padded seat made for comfort. At an older stage of life, comfort becomes a very important thing. You shouldn’t have to settle for a rough, hard commode—and this commode chair gives you all the features you want in a product with the addition of its padded seat. Along with this specification comes the excellent drop arms. With these in places, users can drop the arms out of the way for natural lateral movement and transfers to and from wheelchairs with just the push of a button. At the same time, the arms hold foam handgrips to prevent slips and falls, even if they get wet. While comfort is critical, long-term use is a priority with this chair. The durable construction is heavy-duty and reliable. Adjustable legs make it convenient for all heights, and the removable backrest lets you use the commode over the toilet. A versatile product, you can use this commode at your bedside or in your bathroom. Either way, you can use it with confidence. An increase in weight is something that is possible with aging. 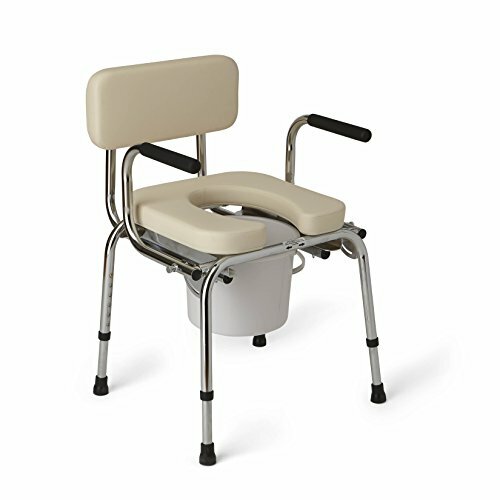 This heavy duty commode accommodates those with a great need for support and confidence by providing reliable construction and a wide-set seat. While less durable or basic models may be perfectly fine for some seniors, others may find themselves with greater needs due to size and weight. As we age, it gets harder to maintain a healthy weight, and so some elderly folks may find that the Drive Medical Heavy Duty Bariatric Folding Commode is the best option for them. Made from durable plastic and smart construction, this commode can support up to 650 pounds. Additionally, the width between the arms is 24 inches, which is wider than the average commode chair and accommodates for a wider girth. Seniors and caregivers alike will appreciate the straightforward, tool-free assembly. Simple, adjustable legs allow you to set the perfect height for your needs, which may include less bend at the knees. 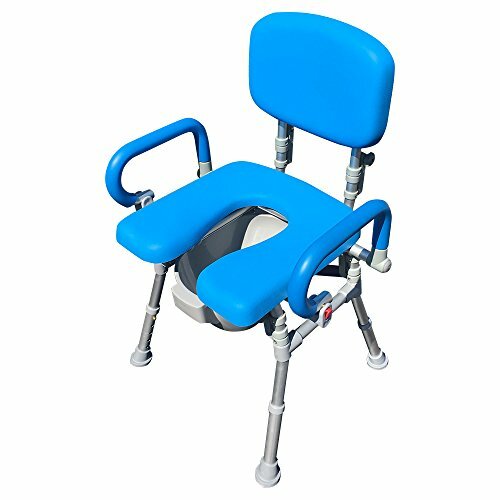 In addition, the adjustable assests let you use this commode not only as a bedside toilet but as a toilet lift for over your bathroom toilet should it be too low. You or your loved one can fold this commode up for convenient storage and transportation, and the product comes complete with a 12-quart commode bucket, a cover, and a splash shield. Bedside commodes are temporary toilets that do not require the use of running water. They function in the same way a toilet would, as a seat to relieve yourself, but instead of flushing, they collect waste in a bucket below. The product is free-standing and portable—some even fold flat for easier transportation or storage. While some of these products are made specifically for bedside use only, many models adjust to fit over toilets as a raised seat. Both of these functions are geared towards mainly senior citizens. Who Needs a Bedside Commode? As we previously mentioned, many bedside commode products are aimed toward the audience of elderly citizens. As we age, and our bodies get older, many everyday tasks become harder to do without assistance. Unfortunately, going to the bathroom is one of them. 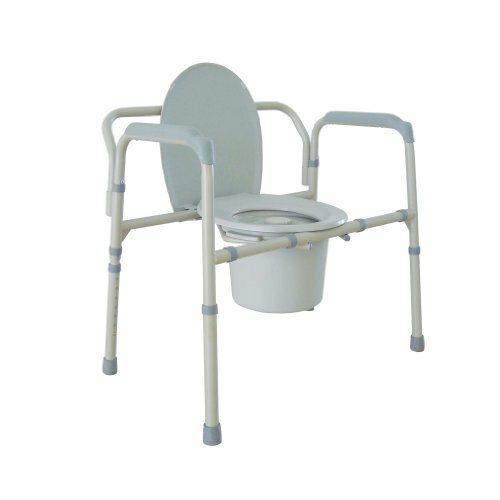 Bedside commodes are excellent products to place at the bedside of a senior who cannot make it to the bathroom in time. The models that go over toilets are also suitable for seniors who can no longer use their original toilet. It may be too low for them to bend down to. Other commodes double as shower chairs as well. 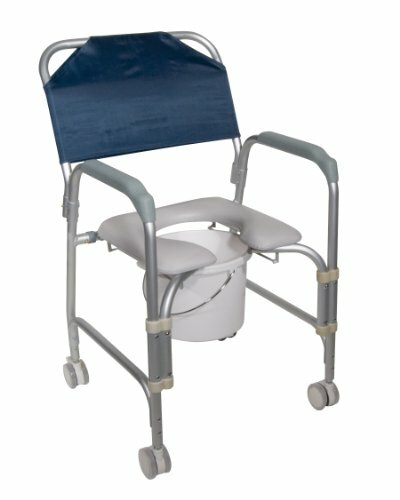 These commodes are waterproof or water-resistant and are great for not only seniors who cannot stand long to shower, but for caregivers who need to bathe their patients or loved ones. Caregivers can get great use out of these products. Commodes make it easier for them to assist older adults in their lives in using the bathroom, showering, and transportation. The challenges and obstacles of getting older can make life seem impossible; even small but necessary things like using the bathroom become tiresome chores. A bedside commode can ease your mind about making it to the restroom in time and with more comfort, and a commode shower chair can help make your life a little easier and safer while you bathe. From comfort to convenience, the chairs we have listed above all offer benefits that make using the bathroom simpler for you in your golden years.